When Oblivion and Doom meet, the Fallout is bound to yield surprises; and perhaps offer some insight into the future of the video game industry. Earlier this week the company behind post-apocalyptic video game hit Fallout 3 bought the developers of famed shooter Doom putting two of the most respected talent pools in the industry, id Software and Bethesda Softworks, under one umbrella: ZeniMax Media. The result, analysts and ZeniMax says, will be studios that can spend more time on the creative process and less cutting deals with outside publishers. It also will mean the blending of the technological prowess and creative artistry of two of the most respected game makers in the industry. The deal, though, is likely the sign of the times says Game Changer Research analyst Billy Pidgeon. "Those stuck between small independent studios and mega publishers are very vulnerable," he said. "A good strategy is to look at where a developer can win." That means focusing more on niches and, when necessary, buddying up with another niche developer. 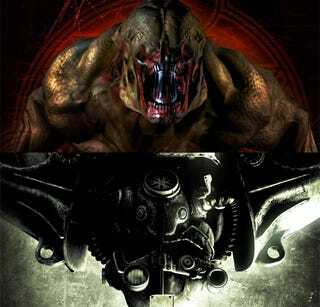 In the case of id Software and Bethesda, the two are each masters of a certain type of game: first-person shooters and role-playing games respectively. "It is possible to narrow to a niche and then dominate in that space, so you can compete better," he said. "A lot of people are going to be disappointed that id didn't remain independent, but it's tough to be independent and these mini-consolidations are better than, say, being swallowed up by Ubisoft." Pidgeon says he thinks this is just the first of what will be more of these mini-consolidations, developers buddying up so they can publish their own games instead of having to pay a chunk of their profits to larger companies to get their games out. Wedbush Morgan analyst Michel Pachter agrees, saying that he wouldn't be surprised if ZeniMax were to purchase or team up with other leading developers like Gears of War creator Epic Games and Left 4 Dead developers Valve. "For Valve and Epic to stay independent maybe they ought to roll up together," Pachter said. "If ZeniMax brought in Epic and Valve then suddenly you would have a powerhouse." The impetus for these consolidations, he says, is that increasingly the larger publishers are less interested in promoting and publishing games that are created and owned by other developers. "Publishers have abandoned third-party developers and everything is moving in-house," he said. The desire for the creative talent behind an endeavor to own the product of their work isn't limited to games. In 1919, Charlie Chaplain, Douglass Fairbanks, Mary Pickford and D.W. Griffith, tired of earning money for big movie studios, consolidated their talents to form their own studio: United Artists. "Bethesda and id getting together is like United Artists getting together," Pachter said. "They got together because they were tired of being employees. They decided they want to own the IP." "That's what ZeniMax is doing. Bethesda and id are independent developers and the fact that they are going to stay independent is good." The idea of ZeniMax buying up or partnering with other talented developers isn't just a theory, it's one of the reasons the company raised $300 million in 2007. "We continue to have discussions with a variety of third-party developers which make the kind of games we like and has the kind of folks we do business with," said Pete Hines, a spokesman for Bethesda Software. "We've heard from a lot of people from every quarter since this news came out." That's how the deal with id Software started, as a friendly conversation between ZeniMax CEO Robert Altman and id president Todd Hollenshead. "They were talking about what we could do together," Hines said. "And the more they talked the more they realized that if we got together the whole would be better than the sum of its parts." It would also allow id to get away from the biggest problem they have, being a small cog in a much larger publisher's machine. "Now they get to be a whole part of the process and the know the publisher will be fully behind them," Hines said. Under the new arrangement id Software will remain mostly untouched and be allowed to do what they do best: Make solid games. But the deal will give id Software the ability to expand their stable of developers, said Hines, who had just returned from a trip to id Software's Texas studio. Already the company is preparing to ramp up their studio from two development teams to three, he said. That means there's a better chance that they will be able to keep the development of their four key game franchises—Doom, Quake, Rage and Wolfenstein—all in-house and rely less on outside development studios. There's also quite a bit of excitement around the idea of Carmack, widely known as a skilled programmer, helping Bethesda tackle some of the issues they've run into in game development. That could mean everything from helping Bethesda create iPhone games and Bethesda helping id on downloadable content for their games to the two solving more technical issues together. "We also hope from a creative standpoint," Hines said, "that [the two studios] can do more together."